As Johann Wolfgang von Goethe once put it himself, “sowing is not as difficult as reaping”. Since then, much has changed owing to the motorization and mechanization of agriculture. And yet, harvesting crops is still an activity in which every helping hand is appreciated. Solutions for improving the efficiency in the harvesting process are therefore like a seed ready to flourish. One instance of this “technological seed” is the WGS (Windrow Guidance System) from SICK. After the cutting of grains and other crops or the mowing of grass and meadow herbs, the loose material is piled into windrows with a hay turning machine. In order to then gather this material with a forage harvester or feed it into a baler, the tractor must be driven over the windrow as efficiently as possible. Gaps, varying curvatures, and heights of the windrows are all irregularities which can lead to the mobile processing machines gathering too much material and thus becoming clogged or being filled in an inefficient way. The result is wasted time and a great deal of work needed in order to put the machine back in order – a bad scenario especially during the harvest with its often tight schedules and the sometimes unpredictable weather patterns. Previously, the driver of the agricultural machine was required to maneuver the vehicle in such a way that the windrows were gathered up perfectly, milled, or pressed into round or square bales that can be transported and put into storage even when the volumes and windrow curves varied. Now, however, the driver has an intelligent harvesting assistant in the form of the WGS. 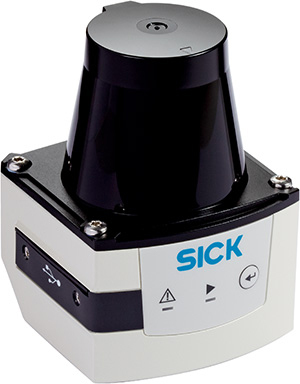 The system consists of a TiM351 2D LiDAR sensor (also 2D laser scanner) as well as an integrated software application for windrow detection which provides its measurement results directly to the vehicle automation system while also being able to process the guidance and speed information of the machine. The LiDAR sensor is mounted to the roof of the driver’s cab and scans the ground in front of the vehicle perpendicularly to the direction of travel. From the data collected, the WGS first generates a profile of the ground, then calculates the position of the windrow relative to the vehicle, and tracks the profile of the windrow. Using the machine movement data collected, the system detects the windrow, whereupon it saves and tracks the position. 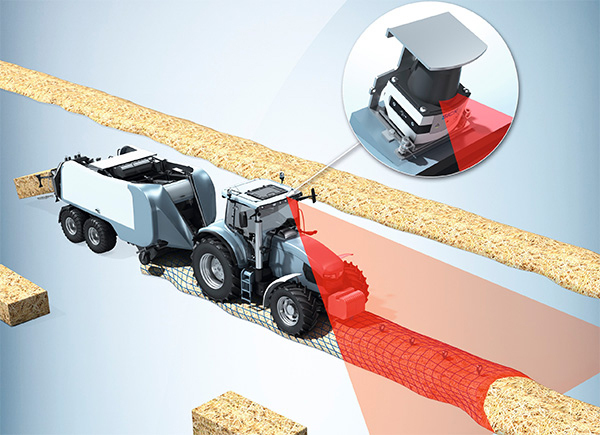 Equipped with this windrow trajectory information, the vehicle control system can automatically steer the tractor along the windrow and maneuver it to the perfect position for gathering the material. At the same time, the windrow volume calculations provide the necessary basis for automated speed regulation – faster travel for smaller windrows, slower travel for higher ones. The clear advantages of driver assistance systems for agricultural machines and processes are prompting more and more manufacturers to integrate systems such as the WGS into their vehicles. A major benefit is that the complete processing of measurement and vehicle data is carried out in the WGS sensor itself, and a CAN bus provides the measurement data to the automation system of a tractor or a mobile harvesting machine. The automation system uses the results without any additional resource-intensive processing directly on the dedicated assistance platform for lateral and speed control. The WGS eases the burden on drivers enormously. Particularly when there are long working hours to deal with, it ensures that driving the vehicle is largely free of stress. The system prevents time-consuming and costly faults from occurring in forage harvesters or balers, while also optimizing their capacity utilization and thus reducing the time spent working on the fields.